Dena Haritos Tsamitis presents her work at the 2015 CyLab Partners Conference. At a time when demand for cybersecurity expertise has never been higher, Carnegie Mellon University (CMU) has just been awarded a $5 million renewal of its National Science Foundation (NSF) CyberCorps Scholarship for Service (SFS) program through 2023. Led by principal investigator Dr. Dena Haritos Tsamitis, the Barbara Lazarus Professor in Information Networking and director of Information Networking Institute (INI), the SFS@CMU program provides students a full-tuition scholarship and a generous stipend for living expenses in exchange for government service in a cybersecurity role after graduation. "Carnegie Mellon is a leader in cybersecurity education and research, and this funding enables the university to leverage its unmatched capabilities and capacity to strengthen the federal corps of cybersecurity personnel," said Haritos Tsamitis. "Our programs attract, educate and develop cybersecurity experts well-positioned to defend our nation and tackle the challenges faced by government agencies." A lack of skilled professionals has long plagued the cybersecurity field, with the Bureau of Labor Statistics reporting that jobs in information security are expected to grow at a rate four times greater than average job growth over the next eight years. "The SFS program in the College of Engineering's INI has been crucial in fostering the next generation of cybersecurity experts, enabling them with the state-of-the-art skills required to serve our nation," said James H. Garrett, Dean of CMU's College of Engineering. 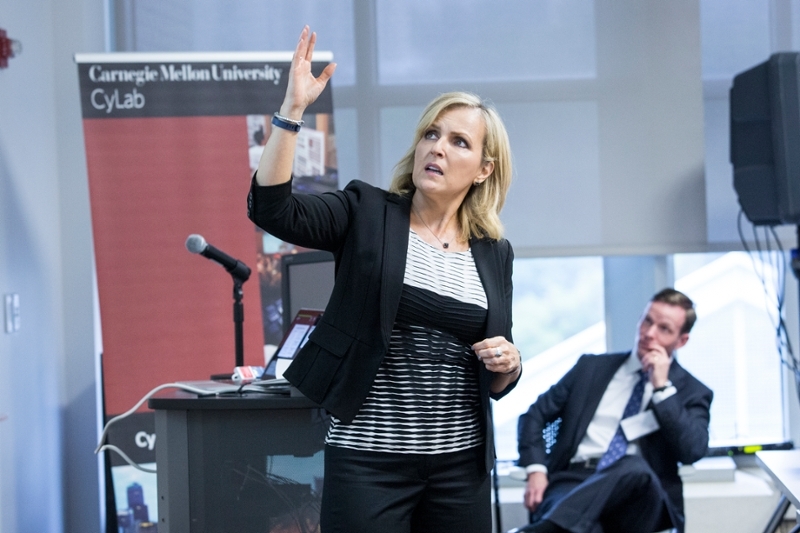 Working to close the cybersecurity skills gap is nothing new at CMU. The university invested heavily in hiring cybersecurity faculty prior to 9/11, and later launched CyLab, the university-wide institute that brings together over 300 researchers in security and privacy. Since 2001, the university has received approximately $25.8 million through the SFS program and graduated 210 SFS students who have gone on to work for the CIA, FBI, NSA, and other federal, state and local government organizations. As a long-standing SFS participant, Carnegie Mellon has expanded its cybersecurity research and education programs over the past 17 years, strengthened the SFS academic experience and broadened its impact in the field. "My job is ultimately to protect the U.S. military and support efforts overseas," says one 2007 SFS alumnus*, who remained in their Department of Defense position after their two-year service commitment ended in 2009. "There are not too many other places where one can have the impact that I feel every day." The $5 million SFS award will fund between five and seven graduate students each year studying information security at Carnegie Mellon. Through this funding, Haritos Tsamitis says her team is focusing their efforts on recruiting highly-qualified CMU electrical and computer engineering, computer science and information systems undergraduates to pursue graduate study in information security. These students now have the opportunity to complete specific course requirements to streamline their entry into an integrated master’s program, enabling them to earn an information security graduate degree in one year rather than two. According to one SFS alumnus*, their daily mission is to help create a safer world by applying the information assurance skills gained in the SFS@CMU program. "The importance of this program is obvious to me each day, as I work alongside many other passionate SFS recipients who apply their unique skill sets to challenging security problems on a daily basis," they said. Carnegie Mellon has two federal designations as a National Center for Academic Excellence (CAE) in Information Assurance/Cyber Defense Education and Information Assurance/Cyber Defense Research. These designations certify the strength of CMU's cybersecurity curriculum and research, enabling the university to participate in the SFS program. With the new award, Carnegie Mellon will continue participating in the multi-university INSuRE (Information Security Research Education) program, including attending the new Summer Start workshop which connects students and faculty from across the country to work on complex cybersecurity challenges for government organizations. * Student and alumni names have been removed due to the nature of their work in federal service.